From April, the Government are implementing changes to the fee structure associated with administering an estate after someone’s death. These changes apply in England and Wales. The good news is that for estates worth less than £50,000, the fee (currently £215 unless applied for through a solicitor, in which case they’re reduced to £155), will be waived entirely. According to the ministry of justice, this means that an additional 25,000 estates won’t have to pay anything at all. However, for the majority, with estates over £50,000, the fee will be higher after April, and subject to a sliding scale depending on the value of the estate. The most one could pay is as high as £6,000. So what are the new fees? Estates worth between £50,000 and £300,000 will pay £250, a rise of £35. Estates worth between £300,000 and £500,000 will pay £750, a rise of £535. Estates worth between £500,000 and £1 million will pay £2,500, a rise of £2,285. Estates worth between £1 million and £1.6 million will pay £4,000, a rise of £3,785. Estates worth between £1.6 million and £2 million will pay £5,000, a rise of £4,785. 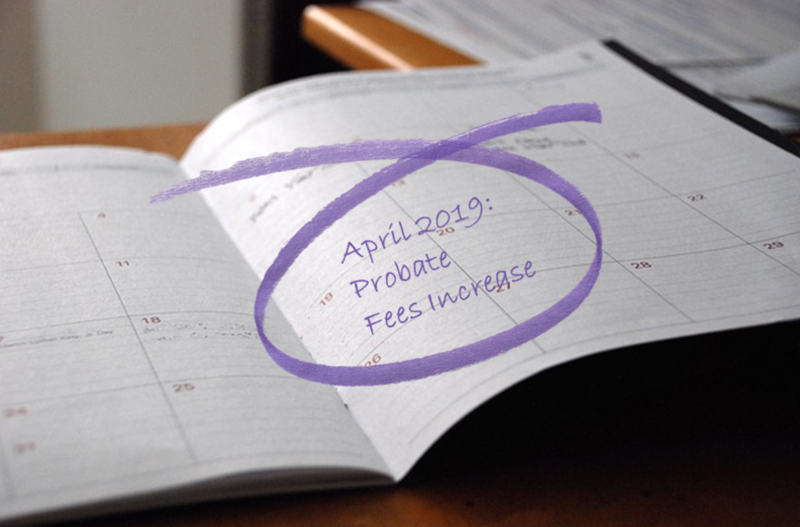 One source of concern regarding these changes (beyond the scale of the fees themselves), is that the burden of paying the probate court fees falls to the executors of the estate, and they’re payable before the grant of representation is issued. In practice, this may mean that the executor has to pay these fees, alongside funeral costs and inheritance tax costs, long before any cash can be released from the assets held within the estate. A recent article in The Telegraph discussed the possibility that these changes may reduce donations to charitable causes, as a result of these costs having to be off-set. And all of this comes amid controversy over whether these fees should have been classified by the government as a tax, thereby forcing the issue to be debated in parliament.